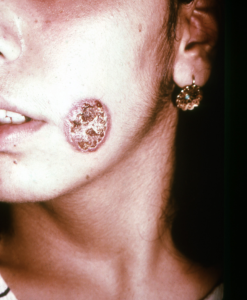 The protozoan parasite Leishmania, transmitted to humans by the bite of a sandfly, may cause disfiguring skin lesions. A virus within the parasite appears to increase the risk of treatment failure with anti-leishmania drugs. A double-stranded RNA virus was found over 20 years ago to infect different species of Leishmania, with up to 50% of clinical isolates infected. Leishmaniavirus (LRV) causes a chronic infection with little effect on the parasite. In mouse models, infection of Leishmania with LRV is associated with increased parasite replication and disease severity. The double-stranded RNA genome of LRV appears to be sensed by the mammalian innate immune system, leading to overproduction of cytokines and a hyper-inflammatory response. Similarly, the dsRNA of Trichomonas vaginalis virus is also sensed by the innate immune system, leading to inflammatory complications. Two independent studies have been done to assess the consequence of LRV infection in human cases of leishmaniasis. In one study, presence of LRV was determined in Leishmania braziliensis isolated from 97 patients in Peru and Bolivia. The patients were treated with pentavalent antimonials or amphotericin B, and the outcome was determined as ‘cured’ or ‘failure’. Thirty-two (33%) Leishmania isolates were found to contain LRV. Treatment failed in 33% of the patients (18 of 54). There were fewer drug failures in the LRV negative isolates (9 of 37, 24%) than in the LRV positive isolates 9 of 17, 53%). These observations demonstrate that presence of LRV is associated with a significant increase in the risk of treatment failure. In the second study, carried out in French Guiyana, 58% of 75 patients with Leishmania guyanensis infection had LRV in the parasite. All the patients with LRV-negative Leishmania were cured after one or two treatments with pentamidine, while 12 of 44 LRV-positive patients (27%) had persistent infections requiring treatment with other drugs. In addition, presence of LRV was associated with high levels of inflammatory cytokines within lesions. The results of both studies show that infection of Leishmania with LRV is associated with drug treatment failure and persistent infection. Determining whether LRV is present in infected patients could therefore guide better treatment strategies. How the presence of the virus leads to such consequences is unknown. The effect might be a consequence of higher parasite numbers associated with LRV infection, which simply overcome already marginal drugs. The host inflammatory response caused by the dsRNA of LRV might also play a role. Understanding the precise mechanism might allow the development of drugs that overcome the effects of LRV. It might also be useful to develop drugs that target LRV, thereby improving the efficacy of anti-Leishmania drugs. Firstly – Nice piece and enjoyable read. Interesting observation. I just wonder, with these small numbers, can we really be confident of an ‘association’ with Leishmania infected LRV and drug treatment failure. Could it not be just down to chance? The numbers are small, and I’m sure additional studies will be done. In this case, the fact that two independent studies came to the same conclusion is a plus. Hope that more researches could be done so as to reveal the unknown reason. Maybe we can get started by studying the virus itself.